Home / ANIMATED FILMS / TALK OF THE TOWN / Vanellope Meets Disney Princesses in "Ralph Breaks the Internet"
Vanellope Meets Disney Princesses in "Ralph Breaks the Internet"
When the trailer showing Vanellope Von Schweetz meeting the Disney Princesses in Ralph Breaks the Internet: Wreck-It Ralph 2 was released in June, it became such a viral sensation it was a miracle that it didn't, well, break the internet. 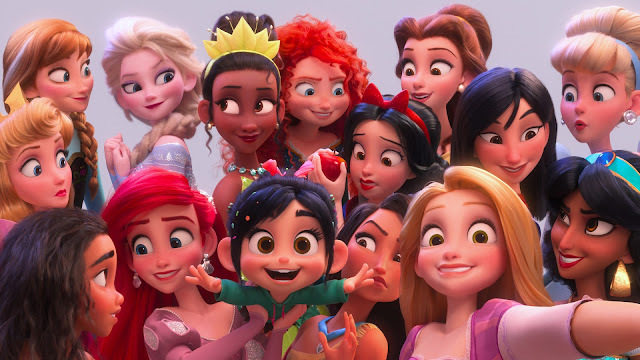 Besides turning to the princesses' original voice talents, the Ralph Breaks the Internet: Wreck-It Ralph 2 team studied the original films, adopting many of the princesses' iconic poses. They also headed to Disneyland, where they learned about the princesses' individual gestures and quirks from the ladies who play the Disney princesses almost on a daily basis. Also a big help was animator Mark Henn, who was the original supervising animator for six of the princesses—Ariel, Belle, Jasmine, Mulan, Pocahontas, and Tiana. Henn also contributed to the animation of Frozen's Anna and Elsa.